The best-accepted hypothesis, as found in dictionaries, is that the term hetman (like captain and many similar military titles) literally means 'head-man', and derives from the Early Modern High German Heubtmann (modern German Hauptmann). The German title was common during medieval times, functionally corresponding to Modern English 'captain'. It has been suggested that the Czech language may have served as an intermediary,[full citation needed] and Polish has also been suggested. Alternatively, it could be a variant of the comparable Turkic title ataman (literally 'father of horsemen'). 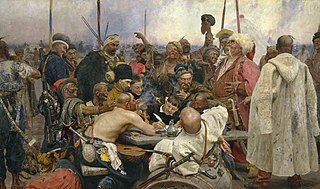 Ataman was a title of Cossack and haidamak leaders of various kinds. In the Russian Empire, the term was the official title of the supreme military commanders of the Cossack armies. The Ukrainian version of the same word is Hetman. Otaman in Ukrainian Cossack forces was a position of a lower rank. The bulava or buława is a ceremonial mace or baton. Chyhyryn is a city and historic site located in the Cherkasy Oblast of central Ukraine. From 1648 to 1669 the city was a Hetman residence. After a forced relocation of the Ruthenian Orthodox metropolitan see from Kiev in 1658, it became a full-fledged capital of the Cossack Hetmanate. Chyhyryn also became a traditional place for the appointment to the office of Hetman of Zaporizhian Host. Chyhyryn serves as administrative center of Chyhyryn Raion. 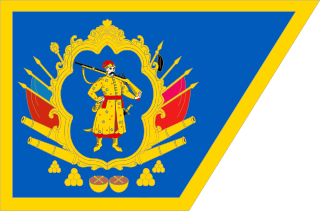 Registered Cossacks comprised special Cossack units of the Polish–Lithuanian Commonwealth army in the 16th and 17th centuries. Yuri Khmelnytsky (1641–1685), younger son of the famous Ukrainian Hetman Bohdan Khmelnytsky and brother of Tymofiy Khmelnytsky, was a Zaporozhian Cossack political and military leader. Although he spent half of his adult life as a monk, he also was Hetman of Ukraine on several occasions — in 1659-1660 and 1678–1681 and starost of Hadiach. For background see The Ruin. Battle of Zhovti Vody was the first significant battle of the Khmelnytsky Uprising. The name of the battle derived from a nearby Zhovta River. Battle of Korsuń, was the second significant battle of the Khmelnytsky Uprising. Near the site of the present-day city of Korsun-Shevchenkivskyi in central Ukraine, a numerically superior force of Cossacks and Crimean Tatars under the command of Hetman Bohdan Khmelnytsky and Tugay Bey attacked and defeated Polish-Lithuanian Commonwealth forces under the command of Hetmans Mikołaj Potocki and Marcin Kalinowski. As in the previous battle at Zhovti Vody, the outmanned Commonwealth forces took a defensive position, retreated, and were thoroughly routed by the opposing force. The history of the Polish–Lithuanian Commonwealth (1648–1764) covers a period in the history of Poland and the Grand Duchy of Lithuania, from the time their joint state became the theater of wars and invasions fought on a great scale in the middle of the 17th century, to the time just before the election of Stanisław August Poniatowski, the last king of the Polish–Lithuanian Commonwealth.